Conveniently located 15 minutes to I-20 Post Road, 50 minutes to Midtown Atlanta, 20 minutes to Douglasville, 20 minutes to Villa Rica, 25 minutes to Carrollton and 25 minutes to Newnan. Close to Walmart, Sam's Club, Publix, Kroger, Restaurants, Health Care, Health Clubs, Library, Farmers Markets and much more. Contact our office at 770-573-0855 to schedule a tour and to view available properties. We are available by phone 7 days a week for information and to schedule appointments. The Lake at St. Andrews is a 105 lot community of exciting new craftsman style homes. The community features a private Lake with lighted pavilion and fishing pier, street lights, underground utilities, county water, county sewer, natural gas and ATT high speed fiber internet underground. but a part of the St. Andrews Golf and Country Club's golf course runs through The Lake. We share no amenities. Memberships with several options are available to St. Andrews Country Club. Membership packages can include golf, tennis, pool and use of the country club. Beautiful Homes with master bedrooms on main, luxurious owner's suites, spacious walk-in closets, garden tub with separate shower, open kitchens with large granite kitchen island, granite counters, tile backsplash, stainless appliances, hardwood floors, ventless fireplace with gas logs, brick & stone accents, Hardie siding & more. Move-In Ready Homes are homes available to be purchased and closed on immediately. Under Construction Homes are homes in which permits have been pulled for a specific floor plan. Floor plans can not be changed. These are available for pre-sale unless noted under contract. Time frames to completion vary, but run under seven months - weather permitting, call for details. 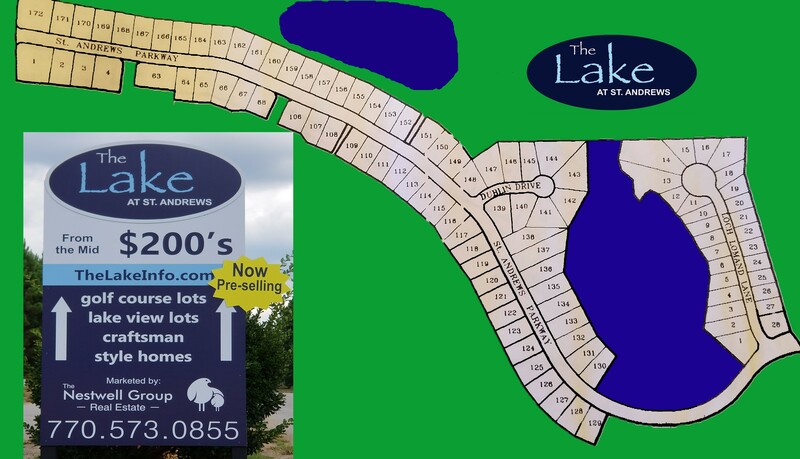 All other lots are available with the ability for you to choose your floor plan. Identical floor plans will not be built side by side. Time frame to completion varies depending contract date and season of the year. Builders will pay $2,500 and Lender will pay $1,500 toward Buyers closing costs & prepaids with the use of The Lake at St. Andrews preferred lender, Caliber Home Loans - Cynthia Hall. You may also use the $4,000 closing cost and prepaids credit to buy down your interest rate. With Caliber Home Loans you may lock in your interest rate up to 1 year on New Construction.